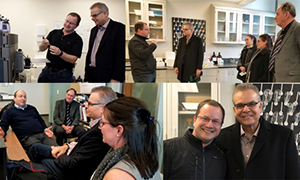 Bryden Award winner Paul Sanberg, a Faculty of Science alumnus, visited the Faculty on Nov. 19, touring several facilities with interim dean EJ Janse van Rensburg, including the YSciCore Analytical Facility led by Derek Wilson (Mass Spectrometry) and Jennifer Steeves’ lab (Psychology). He also talked with Georg Zoidl (Biology) about his work. 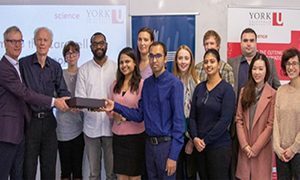 Eleven new Carswell Scholars, from the Faculty of Science and the Lassonde School of Engineering, gave a snapshot of their research at an awards celebration, thanks to Allan Carswell and the Carswell Family Foundation. Read about it in yFile. Grad students and faculty, including Nadia Tsvetkov, Amanda Liczner, Laurence Packer and Amro Zayed (all in Biology), from across southern Ontario and beyond were buzzing at the annual BeeCon conference with presentations on bee behaviour, genetics and genomics, conservation and more. Read more in yFile. Adam Muzzin (Physics and Astronomy) provides insights about the possibility of another large meteorite hitting earth and wiping out life in a new Did YU Know video. Ryan Hili (Chemistry) received the Petro-Canada Young Innovator award, a distinction that recognizes outstanding early career faculty, for his work developing modified nucleic acid polymers. See yFile. Jianhong Wu (Mathematics and Statistics) won a 2018 CPAC Professional Achievement Award in recognition of his successful transition and outstanding achievements as an immigrant to Canada. Wu received the award at the CPAC Gala, an annual fundraising event with some 500 guests in attendance that supports CPAC’s programs helping immigrants succeed in Canada. Jennifer Chen (Chemistry) won the 2018 Award for Outstanding Early-career Achievements in Nanoscience and Nanotechnology from NanoOntario. The award is part of a new program that recognizes the achievements of female scientists and engineers who conduct research and development in nanoscience and nanotechnology across the province. See yFile. Tarnem Afify, a third-year biophysics student, became one of the first York University President’s Ambassadors. See yFile. Paul Delaney (Physics and Astronomy) held a free public viewing evening at the Allan I. Carswell Observatory for the most recent meteor shower, the second in as many months. See yFile. Art Orellana (Chemistry) and Ryan Hili (Chemistry) organized and hosted QOMSBOC 2019, a three-day conference showcasing cutting edge research in synthetic, organic and bioorganic chemistry by top grad students across Ontario and Quebec. The new Physics and Astronomy website is already garnering attention. Grade 6, 7, and 8 students at Lorenville Public School in Brampton found Gloria Orchard (Physics and Astronomy) through the website and wrote to her asking to talk with her about their upcoming project related to safe space travel and the effects of space radiation. The students are part of the First Lego League robotics team, “Martian Mayhem”. First Lego League is an event for middle school students interested in Science, Technology, Engineering, and Math (STEM). The students and Orchard had an interesting and successful Skype meeting. Jane Heffernan (Mathematics and Statistics) organized and hosted the first in a series of Café Mathématique at the Fields Institute with 105 participants, including children, parents, teachers, and retirees. Read about it in yFile. More than 300 high school students attended this year’s Gairdner Student Outreach Lectures at York University thanks to the Gairdner Foundation and its associate scientific director, Ron Pearlman (Biology). See yFile. Neal Madras (Mathematics & Statistics), coordinator of the Integrated Science Program, was invited to a two-day workshop at University of Manitoba, from Nov 15 to 16, prompted by the University of Manitoba’s desire to create its own Integrated Science program. Representatives of programs at McMaster, Western, UBC, Montreal, and Leicester also attended. Science and Technology Studies and Physics and Astronomy, along with the Lassonde School of Engineering co-hosted award-winning science journalist and space historian Andrew Chaikin, who discussed the decisions behind the historic Apollo 8 mission 50 years after the first flight around the moon. See yFile. Eric Hessels (Physics and Astronomy) and his grad students Koskuke Kato and Taylor Skinner achieved the most precise measurement of the fine structure of helium ever recorded. The results, “Ultrahigh-Precision Measurement of the n=2 Triplet P Fine Structure of Atomic Helium Using Frequency-Offset Separated Oscillatory Fields,” were published in the journal Physical Review Letters, where it became an editors’ suggested paper. Read more in yFile. Christopher Lortie (Biology) and colleagues publish new work in the journal of Ecology and Evolution on an endangered and threatened species of lizard. They extensively tracked individuals using radiotelemetry to examine how much space it needs and how it interacts with desert habitats. It is also an example of open science because both the code and data were made transparent to the public for reuse –(code: https://zenodo.org/record/1412857#.W_wDPi0ZPtx and data: https://knb.ecoinformatics.org/view/doi:10.5063/F1736P23). Norman Yan (Biology) did a long interview on the local public radio show “Planet Haliburton” with hosts Terry Moore & Greg Roe about the threats of road salt and calcium decline. Listen to interview. Paul Delaney (Physics and Astronomy) was on numerous radio and television shows, and in print media, talking about the Leonid meteor showers, dark matter hurricanes, the alien spacecraft solar sail, gamma ray bursts and mass extinction possibilities, the NASA Insight landing, and more including CTV’s Your Morning, AM640, NewsChannel, CTV-CFTO, CHML Scott Thompson, Ottawa Citizen, and 1010 John Moores Show. Delaney also did a presentation to a school tour on the solar system, a Girl Guide presentation on the solar system & telescope observing, and he was on a Q&A panel at the York U screening of the new film, Clara. December 19: Faculty of Science Holiday Reception, from 2 to 4pm, in the Schulich Dining Hall. Don’t forget to RSVP!